**Note: Hops cannot be shipped to the state of Oregon. With the growth of craft beer and home brewing, there is great interest in growing your own ingredients, especially the things that give a beer its distinctive character. The particular hops used in beer making are one of the main causes of the differences between one beer and another, so choosing a particular Hops Plant and growing it yourself is an important step in producing a personal, distinctive beer. 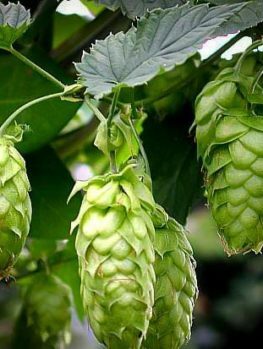 Even if you are not interested in making beer, Hop Plants are attractive, hardy plants that give you great fast-growing screening to cover and hide a fence, wall or shed. A good way to make a screen with hops is to put up some simple trellis panels and plant hops in front. They will need no help to twine their way to the top. 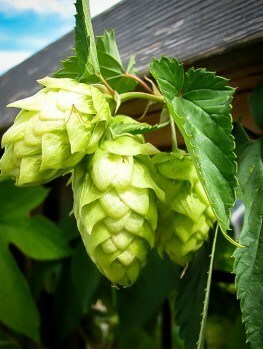 Hops can also be used in pillows to help sleep. The fibers can be used for rope, fabrics and paper-making and the young shoots in spring can be eaten like asparagus. Hop Plants are twining vines. The stem will naturally twine around anything it can, from string to trellis, so they are favorite plants for covering a fence, trellis panels, pergolas and arbors and even dead trees. With a few string attached they can be used to cover a wall or hide an ugly outbuilding. With their large, rich-green leaves they make an attractive backdrop and bring a cool, lush greenness to the garden. They are especially useful in colder regions where many climbing plants will not thrive. 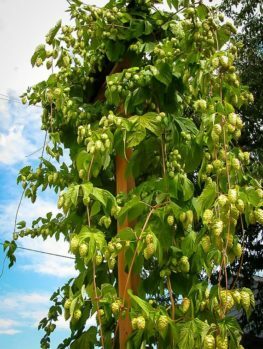 So even if you don’t want to make beer, a Hop Plant is an attractive addition to your garden and a real conversation piece while you and your friends are sharing a beer on a hot day sitting in the cool shade of your Hops Plant. Of course if you are a serious home brewer, having a free supply of high-quality hops for your brewing is a great thing and will give your beer a distinctive character that cannot be obtained using the dried hops commonly available at home brewing supply stores. You can also set a few aside to fill a pillow and help yourself have a great night’s sleep. Hop Plants have a sturdy root system that is hardy down to zone 2, but plants in that zone often do not have a long enough growing season to flower. Every spring the roots send up many new shoots that in mature plants can grow 15 to 25 feet in a single season. In fall the stems die back to the ground. The leaves are large, heart-shaped and lobed, with an irregular edge and they have a long stalk attaching them to the stem.The plants make a full, lush covering over any support and can be grown overhead to give shade below a simple arbor. It is perhaps best to cut down the old stems in the winter, but it is not really necessary except for neatness. Hops have male flowers on one plant and female on another, but named varieties are always female as it is the female plant that produces the actual hops. So it is not a good idea to try to grow hops from seed as around half the plants will be useless and that will not be apparent for several years. Plants grow slowly the first year after planting, but in the second year they will grow strongly and produce a crop. The stems grow strongly in the early part of the season, reaching their full height by mid-summer. Then side branches are produced and these carry the flowers. The flowers form in cone-like structures called strobiles. These are a bit more than an inch long and look like fir cones, but with soft, papery bracts. The strobiles are in clusters and have tiny fruits inside them. The fruits and the strobiles are covered in glands that contain the active ingredients which look like a dry powder. When dried these clusters are the hops that will be used. The different varieties of hops vary in the amounts they contain of the bitter ingredients that both flavor and preserve the beer. The most important ingredient is called lupulin and there are two kinds, alpha acids and beta acids. Alpha acids are the bitter ones, so a strong variety of hops will have lots of them. The beta acids are only slightly bitter and disappear during the brewing. Some hops with high alpha acid content are only used to impart bitterness, while other types give flower, citrus or spice flavors. Some hops, like the Centennial Hops Plant have both aroma and bitterness and they can be used through the whole brewing process. So this variety is an ideal choice if you don’t have the space to grow more than one variety. Others like the Cascade Hops Plant are popular for their complex flavors, although they are less bitter. 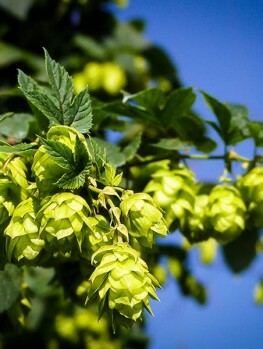 They can be used alone or a bitterer hop can be used in the early stages of brewing and Cascade Hops used for adding flavor when finishing the beer. Hops are very hardy and can be grown in zones 3 to 8, making them great choices for gardens in colder areas. They prefer cooler summer conditions although established plants are very drought tolerant and rarely need extra water. They do best in full sun but will take some shade too. They prefer a deep soil that is rich, acid to neutral, well-drained but damp in spring.Because of their drought-tolerance they do well in sandy soils, but being such a tough plant they will actually grow fine in just about all conditions. Choose a sunny spot for your Hops Plants. To use hops as a screen or if you are growing several for hops production, plant 3 feet apart. If you grow more than one variety leave extra space between the different types so that you don’t mix them when harvesting, as each variety looks basically the same. If you do not have a fence or other structure for them to grown on a pole can be used with strings attached to it to support your plants. Because this is an attractive plant it can be grown in the flower garden as well as alongside your vegetables. Dig the area over well and add some compost or rotted manure to the soil. Use plenty of water when planting and make sure you water well every week during the first season. Hops were used to flavor and preserve alcoholic brews in Holland and other European countries from at least the 14th century. However in England the traditional drink was Ale, made from malt alone, or flavored with honey or other plants like Wormwood, Marjoram or Yarrow. Only in the 16th century did the British start to use hops and at first their use was banned as ‘unwholesome’, even though the hops protected the beer from going bad by killing wild bacteria that interfered with the brewing. Of course in time they came to be universally used for making this new drink called Beer. By the time the main settlers arrived in America the use of hops was normal. Hops also contain substances that when inhaled calm the nervous system, which is why a small pillow stuffed with hops and placed under your main sleeping pillow will help to ensure you get a good night’s sleep. Although commercial growers have a variety of practices they use during growing, most of these are designed to increase the yield, while for a home brewer a plant will produce plenty of hops with very little special care. A general-purpose plant food can be used in spring and early summer to increase the growth and yield if necessary. Once established, your plants will only need watering if the spring is dry or if there is an extended drought during summer. To reduce potential pests and diseases cut down and remove all the year’s growth after harvesting. Hops are harvested when they have ripened. They will usually turn from green to light brown and they will also become sticky, light and papery. The bunches of cones are just pulled or cut from the plants and then thoroughly dried. The easiest way to do this is to spread the cones on a screen laid horizontally in a dry place. Turn them from time to time and in about three days the main stems will snap instead of bend. The hops are now dry and can be stored in zip-lock bags until needed. Storing the bags in the freezer will keep them fresh and full of flavor. 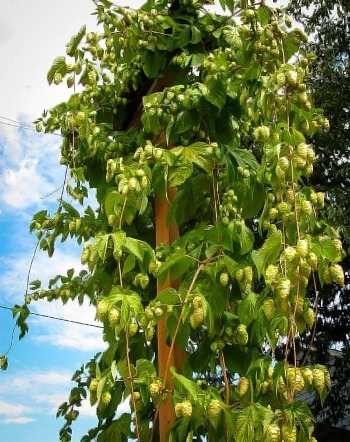 Not only are Hops Plants great to grow if you are interested in doing your own home brewing, but they make an attractive climbing plant that is especially useful in cooler areas where other climbers, like grape vines for example, will not grow well. Their vigorous growth makes them especially useful for covering large fences or walls and for growing on trellis panels to screen an ugly view. They will quickly grow and need no particular care at all.